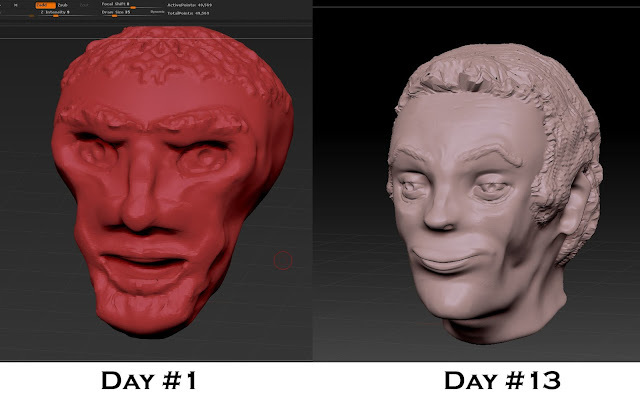 This week saw some good progress in my quest to get as much out of zBrush as I can within the trial period. 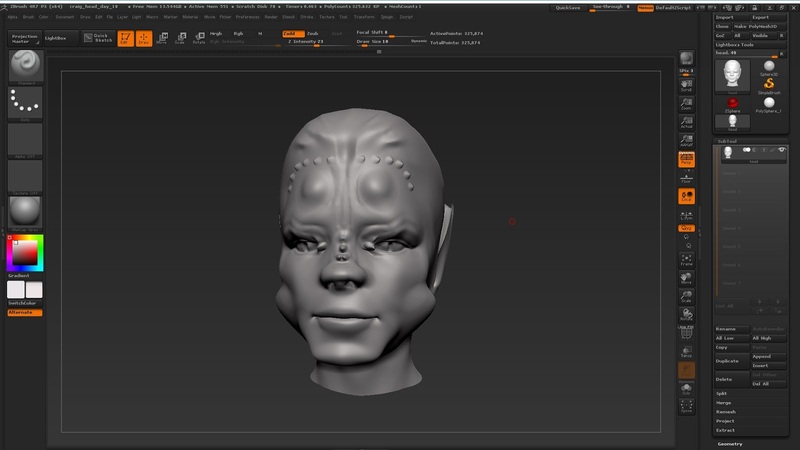 I have been alternating between doing human heads, and some alien / creature type sculpts. Both to provide me with some variety, and to make sure I keep practicing some fundamentals before I try to get ahead of myself. 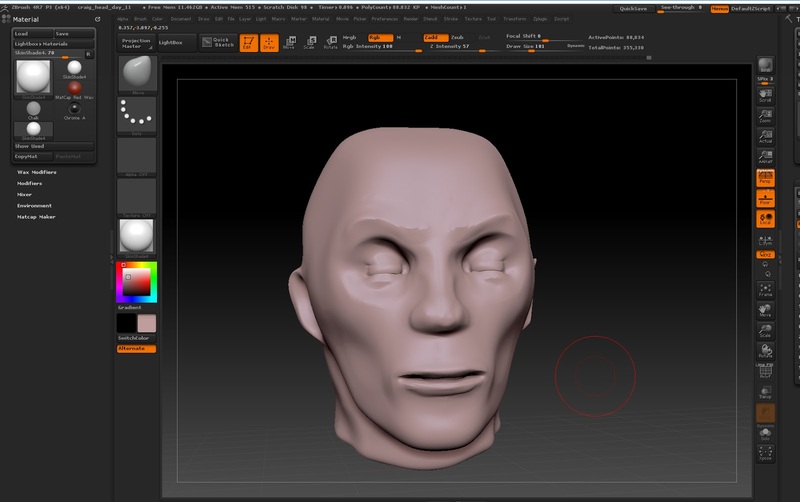 I have dedicated an hour an evening to making a sculpt from scratch. I'm not going back and working on the previous night's practice. I want to practice the core loop of building up my fundamentals. 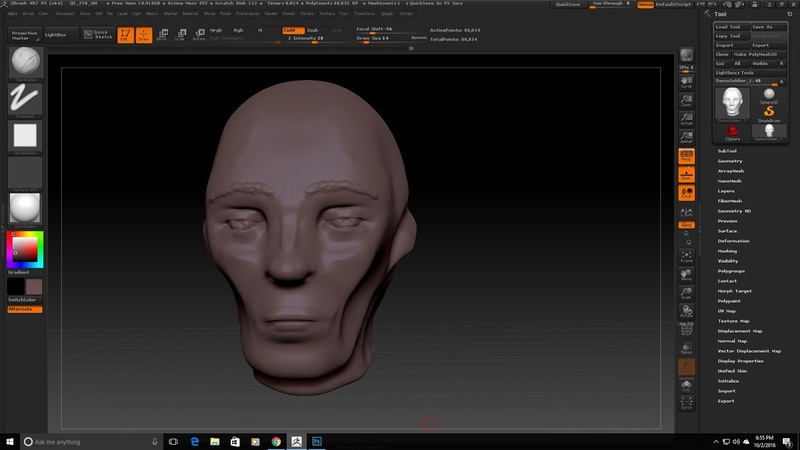 Start with a basic sphere, and work it up to a human (or not so human) head, and then to start to work on a sculpt for one hour. I want to build up the basics involved in that process. The more I practice it, the easier it becomes. I'm consciously trying to avoid going too broad too soon. I want to build up my confidence with the basics of sculpting first. It seems to be going well so far. I'm glad I'm trying to force this discipline upon myself. Eventually I am sure that I'll create a starting point that might be a template I'll start with, but for now the 'from scratch' approach helps me solidify these fundamental skills. I'm already feeling like I'm making solid progress this way. I'm still struggling with the subtool menu somewhat (and haven't yet been able to work with scenes with multiple subtools), and I find myself screwing up my sculpts 'state', mostly losing the dynamesh elements, or keeping the resolution consistent. I think it's just my understanding of how the objects are set up in the scene. So overall, going pretty well, I'm very happy with the progress so far. It's been great posting the daily recaps on Twitter, as it allows me to look back and see my progress! Let's see where it takes me this week!